Courtney Pine and composer Anna Meredith, on the Millennium Bridge, London, look at the view from St Paul's to the Shard, and each create new music that follows that skyline. On old nautical charts as well as the bird's eye view there is often a coastal profile - the outline of the land seen from the point of view of a sailor approaching it. Radio producer Julian May was struck by the musicality of these, the undulations of hills are melodic, the spacing of landmarks - trees, spires - rhythmic. Musicians could, he thought, take the line dividing the earth from the air, place it on a stave, and play the skyline. Prominent musicians were intrigued - the Scottish composer James MacMillan; Julie Fowlis, leading light of Gaelic song; Kizzy Crawford, an eighteen year old singer-songwriter of Welsh and Bajan heritage, at home in the English and Welsh; and Gwilym Simcock the Welsh pianist who writes classical pieces, and improvises, too. For Radio 4 Tim Marlow presents three programmes, in England, Wales and Scotland, in which two musicians look at the skyline, give their responses, then begin playing it. Tim hears how they are getting on and, finally, the musicians, Tim and Radio 4's listeners hear for the first time the finished pieces. The first programme begins in the National Maritime Museum where Robert Blyth, Senior Curator of Maritime History, shows Tim some coastal profiles and ponders what seamen whose lives depended on them might make of the idea that they could be an inspiration for music. 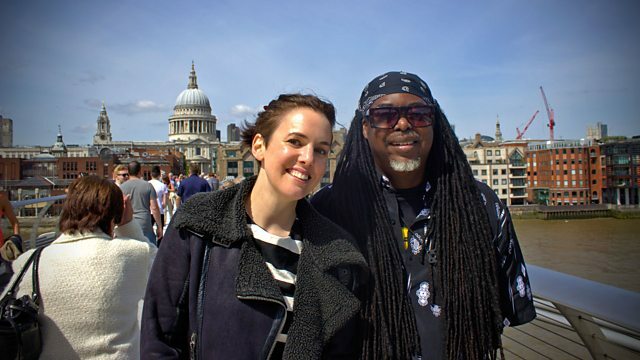 Then jazz musician Courtney Pine and the composer Anna Meredith join Tim on the Millennium Bridge in London. They consider the view from St Paul's, past the Walkie Talkie and Blackfriars Bridge to the Shard. They speak about their responses, what intrigues them, and discuss how they they will render such a dramatic skyline, with its history and physical variety, in sound. Producers: Julian May and Benedict Warren. Why not play your own skyline? Find somewhere that interests you. Draw the line between earth and sky, if you wish, you can trace this onto musical manuscript paper but this isn't essential. Follow the line to create the music of your skyline. Please send a soundfile - mp3 or wav to Playingyourskyline@bbc.co.uk with an image of the skyline you are playing, and, please no longer than three minutes. The first page of Courtney Pine's score of his piece "Skyline"
The first page of Anna Meredith's completed piece for cello and electronics.